Not long ago, the chairman of a diversified conglomerate admitted to me that he was struggling to find a large enough pool of candidates to choose from while seeking to appoint women directors on the boards of his companies. He is not alone. A number of organisations are still busy trying to find suitable women candidates for board positions even as the country’s stock market regulator has moved towards improving gender diversity in corporate boardrooms. On the other hand, it is also true that several well-known Indian entities, particularly banks, are headed by women, many of whom are celebrated as achievers. Many interesting new ventures and startups also have women founders and are going places. So, when talking of women achievers in India, it’s a mixed bag. But as gender diversity becomes an important talking point in corporate circles, there are positive strides being made, which is heartening. 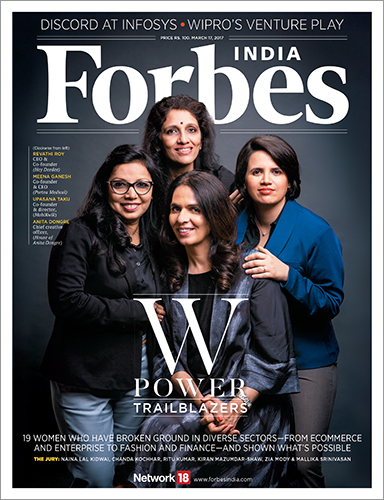 Against this background, Forbes India is proud to bring you the first ever W-Power Trailblazers issue, which celebrates 19 achievers from various fields, both in business and outside it. This maiden selection is surely not an exhaustive list, but it is representative of the kind of achievements Indian women are capable of, despite facing a unique set of challenges. The ability to carry on despite the obstacles in their path makes them worthy of celebration. The 19 women we profile in this issue have been selected by a jury who we like to call “Trailblazers Emeritus ”—Kiran Mazumdar-Shaw, Naina Lal Kidwai, Zia Mody, Chanda Kochhar, Mallika Srinivasan and Ritu Kumar —women who have demonstrated over several years that success can be achieved despite challenges if one has the resolve and the determination to pursue the objective single-mindedly. And the women they have picked, you will find, are trailblazers in their own right. Whether it is Upasana Taku, co-founder of mobile wallet company MobiKwik, Revathi Roy of Hey Deedee, which trains women in last-mile logistics, or Ameera Shah, who has built a successful path-lab business, the inaugural list has achievers from across the spectrum. But what unites them is a resolve to break barriers and chase their dreams. While on trailblazers, this issue also delves into the discord at IT giant Infosys, which has seen its iconic founder NR Narayana Murthy—who has relinquished all positions at the company but remains a shareholder—questioning some decisions taken by the board. The differences did rattle corporate India, but there are encouraging signs that the management is taking note of the concerns even as the rank and file goes about business as usual. The big takeaway from l’affaire Infy is that there are no longer any holy cows when it comes to corporate governance and everyone is accountable. That should be great news for shareholders.